This is a sequel to a post titled A Christmas Tail that I wrote in December 2011, a rags-to-riches story about a savvy street cat who adopted me. This tale is about an entirely different animal. 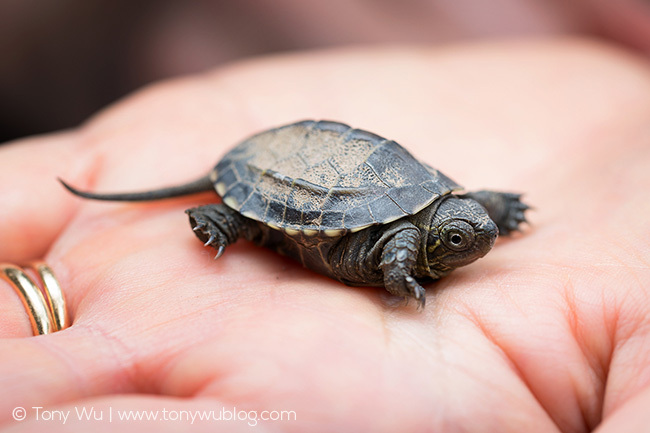 A turtle. 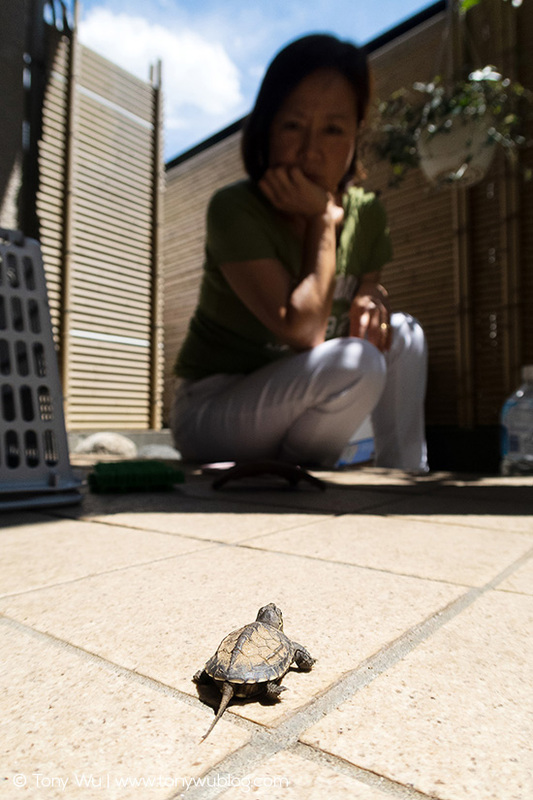 A teeny, tiny tyke of a turtle who one day, when he was very young—far too young to be wandering off on his own in fact—found himself quite unexpectedly on a road, in front of my house, baking on black-as-pitch asphalt, dazed, bewildered, and most likely bemoaning his lot in life. It was the 25th of May 2018, a day that was full of surprises. When I came across him, the turtle was flat against the road. The colour and pattern of his shell was an uncanny match for the texture of the asphalt. The little turtle was, for all practical purposes, camouflaged. In hindsight, that doesn’t seem quite right, as natural selection clearly would not have anticipated the need for this particular turtle to blend-in with a manmade road surface. But so it was, and so it might have ended. Badly. Kettle bells dropped. I dropped, crouched on all fours, nose to turtle, looking for signs of life. His eyes were closed, shell and skin parched, limbs withdrawn. Into my palm he went. Indoors we went. A frantic search for a small container ensued. I filled it with just enough water to cover the turtle and plopped him in. Moments later, his eyes opened. The rest of that day was spent searching the Internet and posting to social media, seeking information and advice on what this little creature was, how it might have ended up where it was, and of course, how to care for it. The long and the short of the considerable drama that followed (culminating the next day in a visit to a socially awkward but very helpful woman who was exceptionally well-versed in the ways of chelonians) is that I named him Master Oogway (see Kung Fu Panda) and worked out his likely origin story. 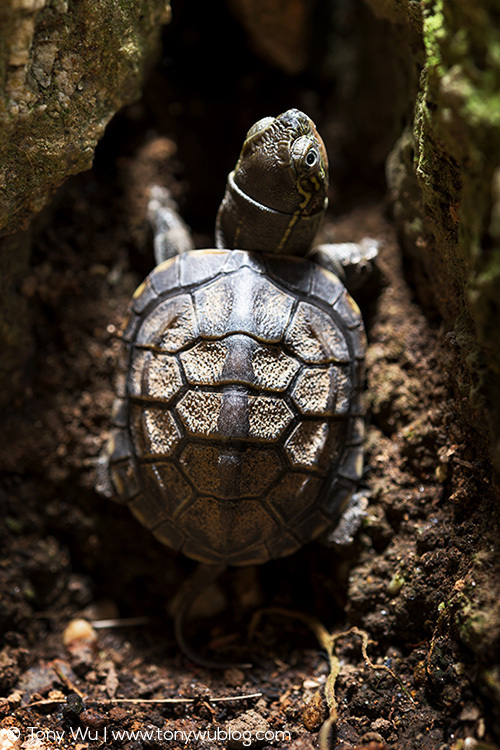 Oogway is a Chinese pond turtle (Mauremys reevesii), not native to where I am. This species is popular in the pet trade, which explains how he, or more accurately, his ancestors, journeyed from his homeland to my current homeland. It doesn’t, however, explain how he came to me. I do not live near enough to any fresh water system for Oogway to have made his way to where I found him. There is also no one in the area who would have acquired him as a pet. The best I can figure is that a crow—there are always many large ones around—snatched him from a river or pond nearby and delivered him by airmail. I guess storks aren’t the only birds that deliver babies. Over the next several months, Oogway became an integral part of our family. Oogway even took to eating from our fingertips. He grew from 2.8cm across the shell when I found him to around 4cm by early October. Things were looking good. Shortly after I returned home in October, Oogway stopped eating. He became lethargic, disinterested. Intellectually, I thought it likely that he was preparing for hibernation. Emotionally however, it became increasingly difficult to watch as time went on. Oogway lost weight. His shell deflated. His spark was gone. We read about how to prepare him for extended slumber, but we also learned that many baby turtles don’t make it through their first winter. 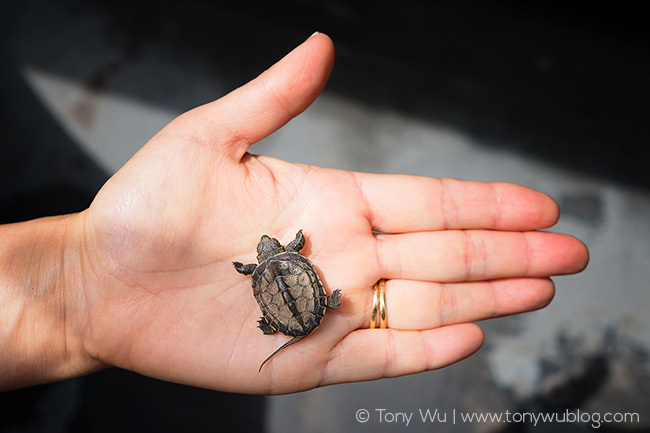 The bigger the turtle, the higher the chances of surviving hibernation. “What?!! !” I thought. There was no way we were going to lose Oogway. 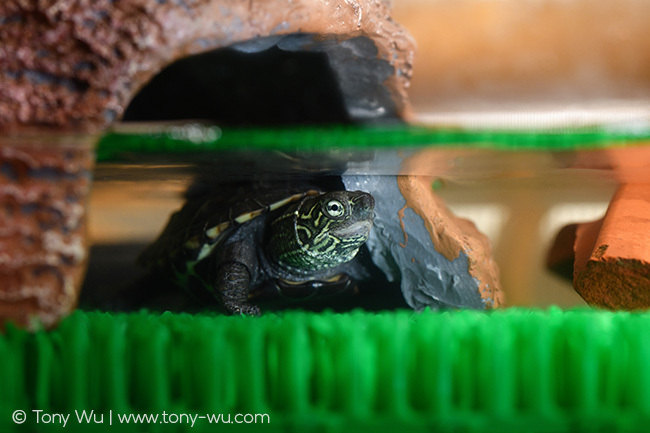 So in late November, we prepared a new and improved home for our lethargic little reptile—a glass terrarium, complete with custom turtle furniture, a water heater, and a sun lamp. We kept the water at a steady 28ºC, and if the sun wasn’t actually shining, we provided him with at least four hours of artificial sun time. For the first week+, nothing changed. He ignored the turtle baby food (yes, there is turtle baby food). There was no look of recognition when I talked to him. We prepared ourselves for the possibility that Oogway might not make it. Then, on 2 December, he ate. When he took the first pellet, I jumped up and down. More impartial observers would probably write something like: "The fool bounced down the stairs like a bunny on a runaway pogo stick." In all fairness, I just wanted everyone else to know that Oogway had eaten. 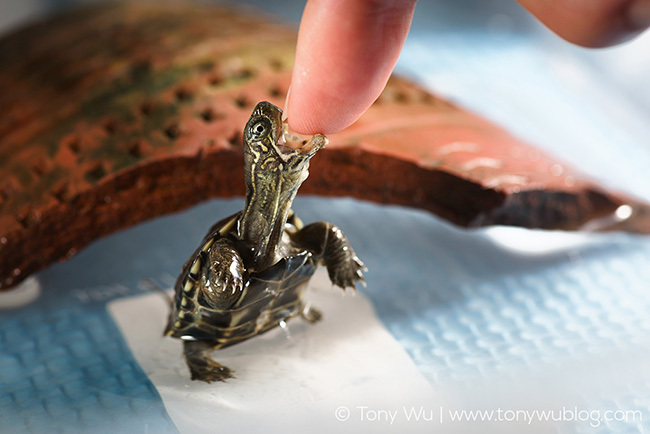 A few days later, on 7 December, Oogway looked up at me, craned his neck and took food from my fingertip! It is difficult to convey the extent of my relief and elation when that happened. This is Oogway now, almost a week later, plump and alert, happily ensconced in his new home. Christmas Day will mark seven months with Oogway. He is a most unexpected addition to our lives, a friend who has brought much laughter and joy, a turtle who will hopefully be with us for many years to come. A constant reminder to cherish the little miracles in life. On that note, permit me this opportunity to wish you a happy holiday season, and a wonderful new year ahead.